Heat oven to 350°F. Cut cookie dough in half crosswise. Cut each section in half lengthwise. With floured fingers, press dough in bottom of ungreased 13x9-inch pan to form crust. Bake 12 to 16 minutes or until light golden brown. Cool completely, about 45 minutes. In medium microwavable bowl, mix chocolate chips and butter. Microwave on High 1 to 2 minutes or until melted and smooth, stirring every 30 seconds. Stir in cocoa, corn syrup and milk until well blended. Add powdered sugar; mix until smooth. Press over cooled crust. 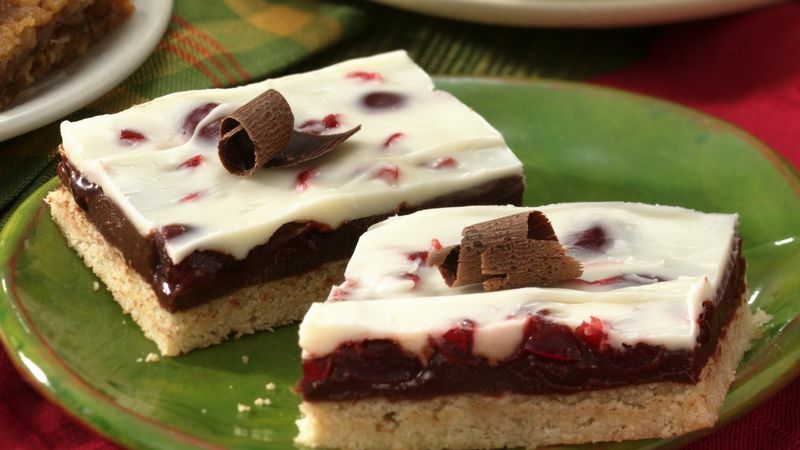 Top with cherries; gently press into filling. In small microwavable bowl, place vanilla baking chips and shortening. Microwave on High 1 to 2 minutes or until melted and smooth, stirring every 30 seconds. Spoon and spread over filling. Refrigerate about 20 minutes or until set. For bars, cut into 8 rows by 6 rows, or cut into diamond-shaped pieces. Garnish with chocolate shavings.